This post is not about sea turtles, but it's about northern red-bellied cooters. 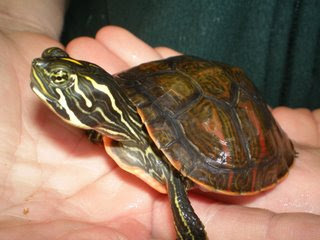 This is a type of freshwater turtle that lives in the Eastern United States, including New Jersey, Pennsylvania, Delaware, Maryland, and Virginia. Interestingly, there is also a population of this species that lives in Plymouth County, MA, several hundred miles away from any other known populations. It used to be thought that Plymouth red-bellied turtles were a separate species, but DNA testing has shown that they are the same species as those that live in other states. However, the Plymouth population is unique enough to be considered as a genetically distinct population. In the 1980's the numbers of red-bellied turtles in Massachusetts was very low, only about 200 - 300 animals, so they were placed on the United States and Massachusetts Endangered Species List. In order to increase the number of red-bellied turtles in Massachusetts, scientists started a project called a "head-start" program. In the wild, many turtle eggs are eaten by animals such as raccoons and skunks. To prevent this, scientists began putting wire cages over red-bellied turtle nests so that the eggs would not be eaten. When the baby turtles hatch in the fall, some of them are brought to institutions like the New England Aquarium, and they are raised over the winter. This way, the turtles grow large enough so that they will not be eaten by fish, crows, frogs, etc. Over the past twenty years, the head-start program has increased the population of red-bellied turtles in Massachusetts up to 2,000 - 3,000 animals! In fact, some head-started turtles have now become old enough to lay eggs of their own. Now that the cold-stun stranding season is securely behind us, we can provide a bit of a summary. 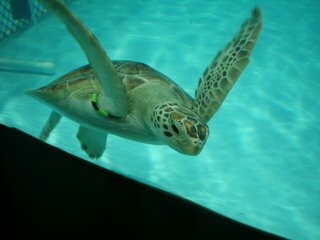 Seventy-seven sea turtles were brought to the Aquarium between October and December, 2008. We thank the staff and volunteers of Mass Audubon's Wellfleet Sanctuary for their hard work in recovering and transporting all of these turtles. Of the 34 turtles that were alive when they were brought to Aquarium, most of them survived. Many of the turtles suffered from severe hypothermia, pneumonia and other problems. Many of the survivors were very sick initially, as you have seen from past posts. Some turtles were unconscious and needed to be placed on a ventilator. 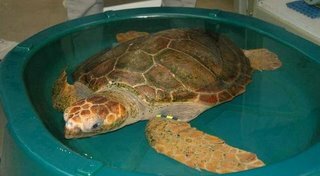 In all, the survivors include twelve Kemp's ridley turtles, nine loggerhead turtles, two green turtles, and one hybrid turtle. Since these are all endangered species, we consider every successful recovery to be important. Eight of these turtles are still here at the Aquarium and can be seen by the public in our Sea Turtle Recovery Room [The space that housed the Sea Turtle Recovery Room is now The Trust Family Foundation Shark and Ray Touch Tank. Rescued sea turtles are now cared for at the new, much larger Animal Care Clinic in Quincy.] and our Aquarium Medical Center. Other turtles are rehabilitating at the National Marine Life Center, Buzzard's Bay, Massachusetts; the Marine Animal Rescue Center at University of New England, Biddeford, Maine; and the Riverhead Foundation, Long Island, New York. We thank everyone that has helped these turtles. Keep an eye on the blog later this summer for the announcement of the big day when the turtles will be released back to the wild! Things are going well for our cold-stunned turtles that were rescued in November and December. We have recently opened several new pools in our Sea Turtle Recovery Room [The space that housed the Sea Turtle Recovery Room is now The Trust Family Foundation Shark and Ray Touch Tank. Rescued sea turtles are now cared for at the new, much larger Animal Care Clinic in Quincy. ], so we have space for more turtles. Yesterday we received three turtles back from the University of New England Marine Animal Rehabilitation Center. These three turtles (two Kemp's ridley and one green turtle) were found stranded on Cape Cod beaches, and were transported to New England Aquarium for emergency care. After several days of care, the turtles' condition had improved, so we coordinated with our colleagues at University of New England to transfer the animals to their facility for further care. This gave us more space to accept additional stranded turtles from Cape Cod. Now that the stranding season is over (our last turtle was stranded in late December), we have room to accept turtles back to the Aquarium to complete their rehabilitation. The turtles will likely remain with us until July or August, when they will be released to the wild. The photo above shows the new green turtle, named Goose. Green turtles are very beautiful. They differ from Kemp's ridley turtles in that they enjoy eating plant material. We thank the staff and students of the University of New England for their assistance, and for the excellent care they provided to these turtles.